When it comes to pricing, time is of the essence. By using LoadDex to aggregate your historical pricing data, you can get quotes to customers faster than your competition. But what about those loads with unique characteristics like extended loading windows, increased transit times due to ELD compliance, early morning pickups, or tight capacity markets? Take LoadDex to the next level with RateDex—our advanced rating tool that allows you to create your own dynamic pricing algorithm that automatically adjusts cost based on rules you set. Under the ELD Mandate, carriers have to charge more per lane on "tweener" loads—loads between 500 and 750 miles. Do you have an analytics platform in place that is dynamic enough to price loads by mileage band? Is your pricing platform smart enough to automatically adjust rates based on upcoming holidays, DOT Roadcheck Week, peak seasons, weather events, or other time-specific factors? 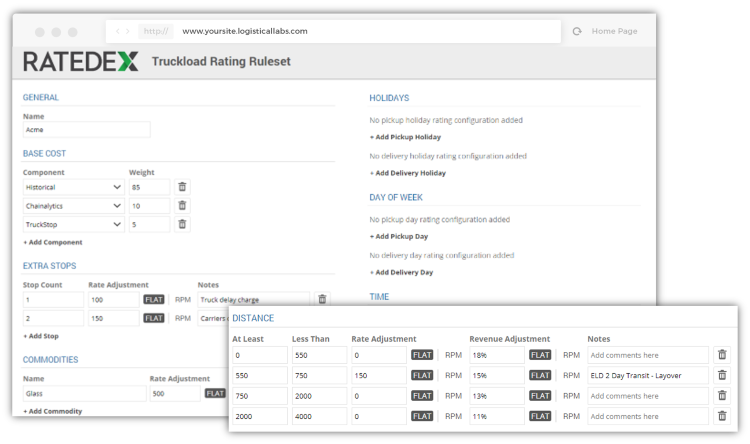 Whether you want to adjust rates by market, commodity, day of week, number of extra stops, or other factors, adaptable truckload rule sets let you create your own pricing algorithm to further eliminate guesswork. Find out how RateDex can take your pricing to a dynamic level.